Today is the beginning of what will be a sad weekend. I’m saying goodbye to a friend I’ve known for over three years. A friend that I’ve lived with. A friend that I’ve snuggled with. A friend that I don’t know how I will live without. I don’t care that this friend will return in four weeks because I don’t want it to leave at all. Yes, I said “it”. Hey. You. Get your mind out of the gutter. Thank you. You see that stud on the right? The hubs? I’m saying farewell to his beard. His wonderfully snuggly goatee. Why? Because of work. He will be traveling next week to a plant that requires all employees and visitors to be beard-free. Because of respirators. That cover the nose and mouth. And a beard would keep it from fitting correctly. Which is important if his life is in danger. But that doesn’t make me any less sad. Nope. Still sad. It took me 2 months to get used to that beard and now the hubs is going to be baby-faced for the next month while it grows back into place. I’m still trying to talk him into keeping the mustache though. Because that could be funny. We shall see. Fingers crossed he doesn’t shave until I get home. Because I want need to take before – during – after photos of my friend’s departure. I know it’s just hair but I think he’s so darn handsome with it. And I love those bearded kisses dammit. What’s a girl to do? But grow her own. rchilly2000 - HEHEHE…you crack me up brooke. I am glad I am not the only one who likes facial hair on a man. I hate when Brian has to shave his red stubble. amyhasbangs - funniest post of all time. amazing. Victoria - Ohh, I understand your pain. My husband can’t grow any kind of beard because he has to be respirator ready at his job. Though he can grow a mustache, I try to detour him from it ’cause I’m a controlling, mean wife who has strict rules about facial hair! shutterboo - You finally get used to it, expect it and then WOOSH! it’s gone. shutterboo - Thanks Bro. Maybe it’s a family thing. DAd’s side – because none of Mom’s brothers having dashing beards like ours. You should show how beards effect females of any age. If Bro doesn’t mind you should let your friends see how a 2 year old acts when her daddy shaves off his beard. 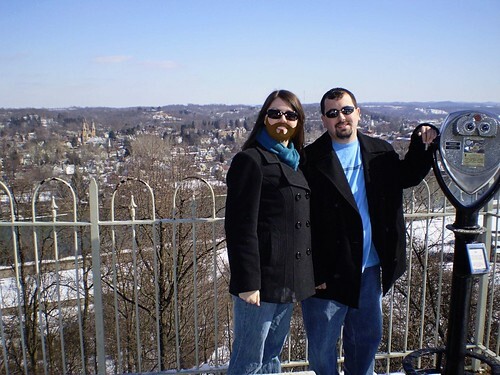 Shelli - I hate to say it, but I think his looks better than yours, and I’m NOT one who likes facial hair. Although, ironically, every man that I’ve ever kissed has had either a mustache or goatee. And I HATE feeling tiny little needles pricking me in my nose or lips or surrounding sensitive skin. I’m a bit perplexed at how you consider it snuggly? shutterboo - Well, you said it: you’re too sensitive. Amie - It’s a nice look on you :-) I have the same thing with my hubs, and he hasn’t shaved in a few years because of me. He’d happily say goodbye to it though. © 2019 Shutterboo Photography|ProPhoto Photo Theme by NetRivet, Inc.